Muddy Plimsolls knows how to teach great, effective weight loss exercise so that our clients really learn to perform exercise well. And we do it to a high standard, mindful of our clients’ fitness levels, confidence level and mindset. If you’re looking to lose weight and are involving an exercise plan, keep in mind these four key approaches to each and every workout. Compound exercises are the big movements that are central to a weight loss exercise programme. Squats, pushes and pulls. Performed correctly (moving through a wide but safe range of movement at the joint) you will engage a large proportion of muscle fibres, make the exercise more demanding and burn more calories. Weighted exercise is resistance exercise. So long as your movement is resisted, you will burn way more calories and become much stronger, faster. Forms of resistance typically are static, heavy objects like dumbbells. 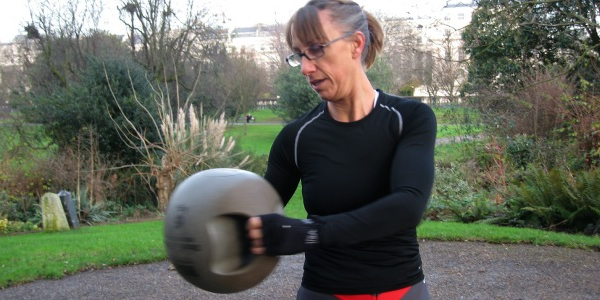 Most Muddy Plimsolls trainers mix up a kettlebell with resistance bands, ankle weights or even their own body to add resistance to a client’s workout. The rate at which you move also determines the calories burnt. Just slightly speeding up the time it takes you to perform a push-up will dramatically increase the results. But ‘quick’ doesn’t mean ‘as fast as possible’. Keep your movements controllable and precise. Need help with your own weight loss exercise plans? Work with the best mobile personal trainers in London and receive super-effective workouts and practical nutritional coaching. We offer a Happiness Guarantee on your first workout and secure online payment options.Choose a 1, 3 or 6 month weight loss exercise plan in our online shop.